Ah, another cheap product cash-in. We love our oddball movies, and The Garbage Pail Kids Movie is certainly that. 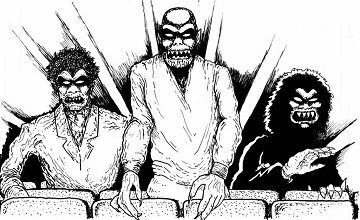 As tonally off as any movie we’ve discussed on the Really Awful Movies Podcast, we were nonetheless thrilled to visit this bizarre late eighties entry. The plot: a kid, Dodger, is being bullied. He seeks the sagely advice of the owner of an antique shop, who also happens to have among his chachkas/wares, a garbage pail meteorite. The proprietor warns the youngster, that while he’s working a shift, he is absolutely not to touch said trash can. But touch he does, and bam, a bunch of creatures are unleashed. 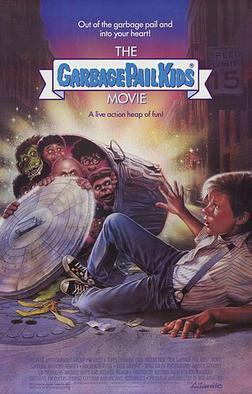 Based on the toy/bubblegum cards and short-lived TV show, The Garbage Pail Kids were meant to lampoon that craze of toyland, The Cabbage Patch Kids. Anyway, there is lots to love about this rather weird little gem. At no point in its short run time, does it not bewilder and amaze with its weird choices. There is a love interest for Dodger, who looks to be considerably older than he is, in an age-inappropriate romance (and yet the lovebirds in real life were a mere year or so apart). There are dreadful songs, weird animatronics, and more. A Disney movie where Ben Stiller runs a fat camp? What’s this movie called, “Box Office Poison”? (to quote an infamous Norm MacDonald appearance on Conan O’Brien). It’s hard to believe someone actually green-lit Heavyweights (or Heavy Weights as it’s sometimes known). This 90s-era comedy came and went with little fanfare. Like many flicks that are not successful theatrically, the film has since garnered a cult following, probably because of the involvement of co-writer Judd Apatow along with Stiller. As a new owner of a fat camp (which he has purchased from a kindly, if ineffectual elderly duo), Tony Perkis is tasked with whipping a bunch of teen boys into shape. The boys (who include among their ranks, Fat Albert and Saturday Night Live standout Kenan Thompson) are none too happy about this and decide to stage a coup along with camp counselor and co-conspirator, Pat (played by Frasier’s Tom McGowan). It’s tonally very odd, but it’s also an interesting look at the comedy star Ben Stiller would soon become. Perkis’ is a fantastically over-the-the-top workshopping of a character. When Heavyweights focuses on him, the film comes to life, otherwise, it sags. Still, there is surprisingly enough to recommend it even if it falls into the trappings of other summer camp-type movies, Meatballs, etc. Join us on this unique episode of the Really Awful Movies Podcast!